Cook noodles in a large pot of boiling water until just tender (follow instructions on the package). Drain, rinse with cold water, drain again, and place in a large serving bowl (or divide the mixture in two for individual servings). Heat vegetable oil in a medium skillet over medium heat. Add pork, season with salt and pepper, and cook for a couple of minutes (no need to fully cook the meat at this point). Add ginger; cook until pork gets lightly browned, about 2 minutes more. Stir in chicken stock, then add the chili oil, red vinegar, soy sauce, tahini, peppercorns, and a pinch of sugar. Simmer everything together until the sauce thickens, about 7 minutes. 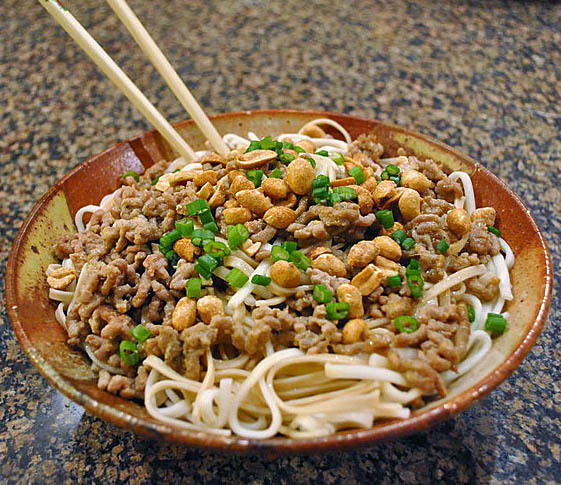 Pour pork mixture over noodles; garnish with peanuts and scallions. Comments: If you don’t have Chinese peppercorns, simply omit them. I am the lucky owner of a bag of these peppercorns brought from China by a former graduate student in our lab. But, it’s also available online from many sources, including one of my favorite stores, The Spice House. Usually, Phil and I agree on our assessment of a recipe. This time we didn’t. I loved it, he felt it was a tad too heavy and oily. Next time I might reduce the amount of oil used to saute the pork, and use peanut butter instead of tahini, dissolving it well in the other components of the sauce before adding to the pan. « SPANAKOPITA MEATBALLS: NO SECRET! Looks so good Sally, I would love the spicier version. I love noodle dishes and don’t have them often enough.This looks like it would be a quick and tasty dinner to make with minimal preparation. This looks great – I remember how much I used to love Dan Dan noodles. Thanks! I don’t cook enough with peanuts, or pork for that matter. Seriously! This looks fantastic. I’ve never used szechuan peppercorns!! Must discover. I agree, udon is so satisfying and you wouldn’t believe it Sally, I was walking from home from the gym yesterday and dreaming of peanuts and noodles… I have a major craving right now! Great post. When I first saw the picture with the post it made me smie because I have the exact same plate. I really like the flavors in this one, do you think I can use beef or chicken instead of pork? Cool! We have the same plate! Yummy! I make a cold Chinese noodle salad that uses peanut butter (I’m lazy and usually use spaghetti rather than proper Asian noodles), but I’ve never had it hot with pork in it. If I were using tahini, I might sprinkle sesame seeds on top. oh, yeah…. sesame seeds on top, I should have done that! I used ramen instead of udon, cause I couldn’t find udon, and I was anxious to try the recipe. I used beef instead of pork and I put a Tbs of sesame oil instead of tahini, and 2 Tbs of roasted sesame seeds. This dish is a keeper, simple to make, quick and absolutely delicious! ps: almost forgot… a big “thank you” from Vlad! Wonderful that Vlad loved it so much! Pingback: Ce mai e nou? Despre maia si altele. | Apa. Faina. Sare.